It’s my intention for this blog to be more than just an exercise in techno-narcissism. You’re probably not going to hear “totally stoked for PBJ’s for lunch!” or anything (my love of peanut butter notwithstanding). I simply figure that we’re not the only folks on the journey for life’s food and wine pleasures, and seeing how we take ours can serve as either inspiration or cautionary tale for similarly-minded folks. We’re often in the hunt for easy-to-make but tasty dishes, and this Penne alla Vodka interpretation fits the bill. Often a vodka sauce will have you puree the whole tomatoes and end up very creamy. We wanted to try to make it a little less heavy, so we went with the diced tomatoes as they came from the can. Over a medium heat, we sautéed the onions, then added the tomato paste, stirring lightly, until the onions just got golden on the edges, maybe 3 minutes. We then added the garlic and the pepper flakes, cooking it up until the sauté became fragrant, about a minute later. We put the water on to boil here, but waited until a bit later to add the pasta. We then stirred in the tomatoes, and about a half teaspoon of salt. If you’re using an open flame, I advise taking the pan off the stovetop to add the vodka. Since the heat was low and we have an induction cook-top, we slowly poured in the vodka. While that was going on, we put the penne in the boiling water. The penne called for 11 minutes, so we put it on 9. With the pasta going, we stirred the sauce frequently, keeping an eye on the heat—we didn’t want to get too hot and break down the tomatoes. At the nine-minute mark for the pasta, when we were pretty sure the alcohol flavor had burned off the sauce, we stirred in the cream. As we cooked that until it got hot (about a minute), we drained the pasta, then added the pasta to the sauce for another minute of cooking. Grated parm topped it, and it was ready to eat. We also wanted a fresh and easy salad that we hadn’t tried before, so we took an Ina Garten recipe for celery and parm salad. 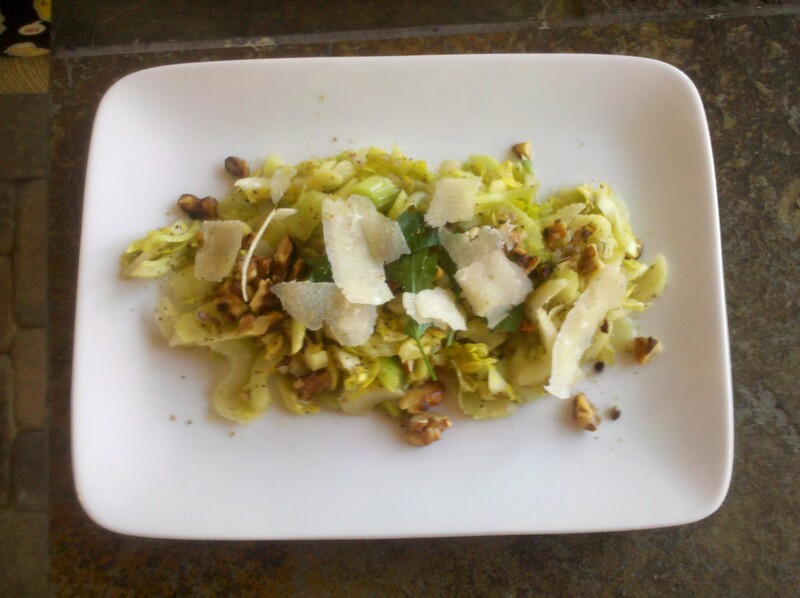 In this form, the celery was a little reminiscent of fennel. The citrus made it quite fresh and spring-like. It’s something that I wouldn’t go to the well with very often, but it was a rather nice change of pace. The wine was 2001 Feudi di San Gregorio Taurasi Riserva Piano di Montevergine, an Aglianco-based effort from Campania that I had picked up off of Wine Til Sold Out for right around $40. It was a modestly good pairing, but a beautiful wine to sit and drink over the glorious spring afternoon. Sounds great! Sheldon, I am loving this new blog, by the way. I’m definitely going to try making some of these. 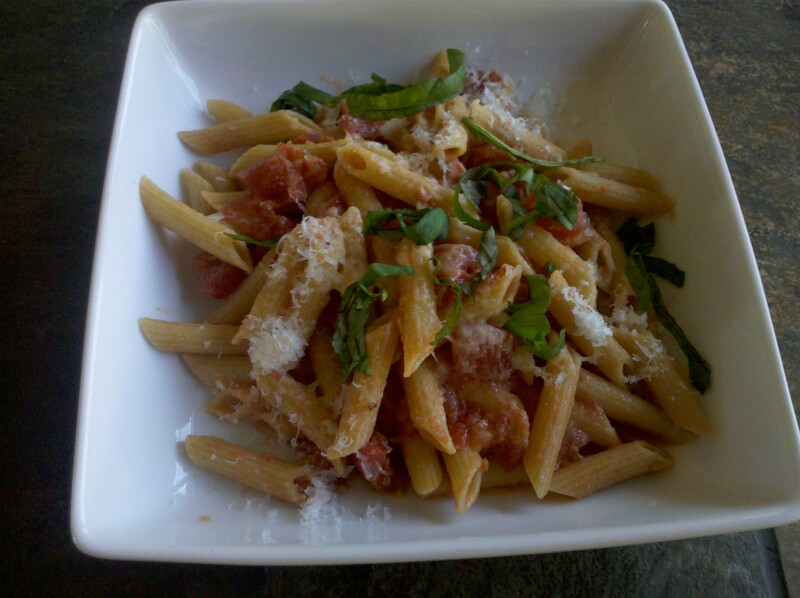 This is one of my favorite pasta recipes, we love it during the summer when we can toss in fresh tomatoes and basil, and homemade mozzarella on the side. I agree with Jeff, great blog. It could use more pictures though. Mmmmmm, thank goodness I am on a diet break because I have all the ingredients (minus the vodka but that’s easy enough to acquire) to give this a whirl!! LOVE this new blog, Sheldon! Hi, we are happy to see that you choose our Piano di Montevergine! What do you think about our white wines? Please let us know on our Facebook fan page “I Vini dei Feudi di San Gregorio”(www.facebook.com/feudisg) …we are waiting for your opinions!